When you hear the word “diabetes,” what comes to mind? Odds are you thought of topics like insulin, sugar, exercise, and weight loss. You probably don’t think about changes in thinking ability or memory. But studies show some surprising links between diabetes and mental decline. Many of the molecular and biochemical defects found in type 1 or type 2 diabetes patients were identical to those in Alzheimer disease. Diabetes, and other insulin-resistance disease states, including diabetes, obesity, and nonalcoholic fatty liver disease, can cause Alzheimer’s disease to progress and worsen. Fascinatingly, the treatment measures used for diabetes show effectiveness when used in the treatment of people with early and moderate stages of Alzheimer’s disease. Specialists like endocrinologists should play a larger role in the early detection and monitoring of cognitive impairment in obese and/or diabetic patients. Another study found that people with type-2 diabetes were more likely to do poorly on tests of learning and memory than people with type-1 diabetes. Unfortunately, the rapidly growing rate of obesity and type-2 diabetes cases may mean a substantial increase in people suffering from these kinds of symptoms. 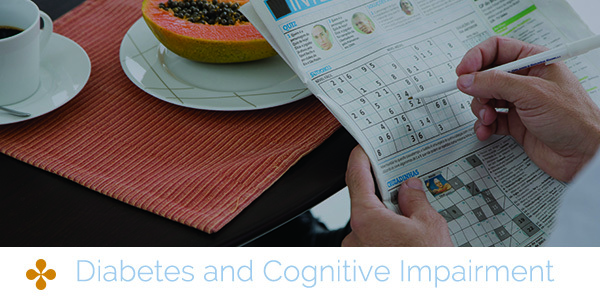 Learn more about Prediabetes, a condition that typically precedes a full diabetes diagnosis, and the risk factors for Alzheimer’s. Consult your physician if you are worried about your risk for either disease, or if you notice significant changes in your memory or cognition.